English Oak or Pedunculate Oak (Quercus robur) is a British native tree and as such a feature of the landscape. 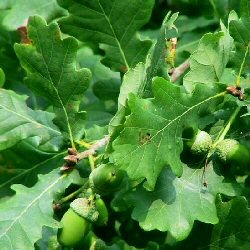 Noted for its distinctive oak leaves and distinctive groups of acorns, this tree is renowned for its longevity, think of Windsor Great Park and Sherwood Forest and Robin Hood association. English Oak also was used in the 18th Century as one of the main timber woods for the British Royal Navy. Given that this tree can reach impressive heights (87ft) and long lifespan (500 - 1000 years and still there! ), they should be planted for prosperity. They can tolerate most soils, except shallow soil, and make a great specimen tree in large gardens, parks and Country House policy woodland. Our English Oak or Pedunculate Oak is supplied at a height of 1.0 metre in a 7 litre container, which means that the tree has an already established root system and therefore this tree can be planted any time of the year and with better results than either bare-root or rootballed trees.